"Come on Rangers you can do it! Put a little power into it!" – the echoes from the sideline as the Rangers fight for victory! From yelling to performing intense physical activities for team motivation or entertaining the audience, cheerleading can determine how a team performs in any game; believe it or not. As a cheerleader, your competitiveness depends on how well you carry out your organized routines. These routines usually last for one to five minutes and may include cheers, tumbling, jumps, and dances. With those physical activities in mind, you need to have the right footwear to help you cheer at your best. The best cheer shoes usually assist in empowering your movement on the court or field by improving your flexibility, agility, and comfort. Cheerleading shoes typically come in different styles, colors, and under different brands, but which one is the best one for you? Below, we discover the best shoes for extreme cheering performance. Let’s see if we can find your perfect pair! Rock the world of cheerleading with a pair of Nfinity Vengeance on your feet. Jump, climb, dance, and tumble in style, comfort, and with great flexibility. The crowd will never know what hit them! The Nfinity Vengeance is an exceptionally light and flexible shoe with superior quality. Whether you cheer for a collegiate level team, they will be the best cheer shoes you’ve ever worn! They fit comfortable and give your bases a great feel for your feet. These Nfinity shoes are designed to fit very snug when compared to normal shoes. This design allows the shoes to be very tight on the foot with absolutely no movement inside, hence, helping you deliver intense physical routines. Thanks to the extra air circulation, you can say goodbye to unpleasant odors and welcome the increased freshness within the shoes. Besides, your teammates won’t have to run for cover when you take your shoes off in the dressing room. Can I get an Amen? The Nfinity Vengeance is also incredibly cute. All eyes will be stuck to you for the duration of your routine. The shoes have a synthetic upper and a lace-up system to keep your foot in place at all times. Talk about security! Take your cheerleading to the next level with the Nfinity Vengeance. It comes with exceptional features to keep you comfortable, flexible, and fresh while taking the forefront of your routines. Nike is an all-time favorite when it comes to shoes for cheerleaders. If you’re a cheerleader who wants that lightweight comfort, support, and flexible to excel your cheering performance, then do it with the Nike Sideline III. The Nike Sideline III is super streamlined for a fantastic silhouette and perforated for extreme breathability with a mesh tongue at the top. There’s no time to worry when things get heated because your feet will remain cool for the entire time. The Sideline III is fully lined on the interior for added comfort. You also get great cushioning in the foot bed all on a durable rubber outsole that’s nice and flexible with a pivot for quick turns. My favorite part of the clear window on the outer side of the shoes that you can place your team colors with the color swatches that come with the shoes. Subsequently, you can customize the shoe’s appearance by changing the color cards behind the cutouts in the upper. Whether on the field or the court, support is always important. Thanks to the durable Pylon midsole, you get cushioned support for improved stability, comfort, and flexibility. ​Nike’s popularity in producing some of the best cheers shoes is no surprise. The Nike Sideline II is no different in that it provides you with the required levels of comfort, traction, agility, and flexibility for extreme cheer performance. Asics have been in our hearts ever since their introduction to the world of sports footwear. Unsurprisingly, they’ve created a landmark with the GEL-Cheer 6 as one of the world’s best shoes. The design style of the GEL-Ultimate is aimed toward recreational and competitive cheerleading. Additionally, the shoes come with a set of color-changing inserts that you can use to coordinate with your team colors. If you’re familiar with the Kaepa Prism or Power Cheer 2, this shoe is extremely similar. As a personal recommendation, this shoe tends to run a half size larger than regular street shoe sizes and is available for women and kids. Imagine that your feet can remain fresh and dry all day long because of the mesh tongue that adds breathability to the shoe’s design. Additionally, the textile lining does a great job at providing a soft feel. The thing I like most about the Gel-Ultimate is that its low and lightweight design won’t hinder your movement. The synthetic leather upper is supportive, stylish, and soft. Not to mention the rubber sole that helps you remain flexible and stable throughout your cheering routines. The Asics Gel-Ultimate is your ultimate shoe for superior on-court or on-field performance. This shoe is designed for recreational or competitive cheerleading and has all the features (both basic and advanced) to give you the much-needed comfort, flexibility, and ease of movement. Enjoy a “Nfinity” success with the high-performance Nfinity Adult Evolution designed to help you move with great flexibility and agility when dancing, jumping, or tumbling. The Adult Evolution is very flexible and lightweight. It showcases an excellent ability to grip surfaces for bases and comes in a red hard shell carry case. These shoes also have Sateen and leather upper to provide you with exceptional support and breathability. Imagine that you can get enhanced cushioning, arch support, and superior comfort in your underfoot because of the ergonomically designed insole which matches the contours of your underfoot. Consequently, the Adult Evolution helps you to meet your performance needs on a spring floor. Have you ever worn shoes that don’t fit properly? Something like hell on earth, in my view. However, the Evolution Cheer provides a natural fit around the toes and impact area. It also features the Ankle Lock Technology which enhances the fit of the heel. If you’re tired of your shoes falling off during your routines, then the feather-light Bubble laces for a more secure fit. These shoes are just amazing. Believe me! The Nfinity Adult Evolution is a lightweight and high-performance shoe designed to provide extreme support and flexibility throughout jet set stunts. Don’t miss out on this opportunity to boost your performance with the Nfinity Adult Evolution. A lightweight and quality pair of shoes is always important in any competition. The Women’s Ace has a synthetic upper and the traditional lace-up system to give your foot a secure fit. It’s only available in white, but this is great since they’re so easy to clean. By using some water, soap, and a small amount of bleach, you’ll have a brand new shoe even after cheering on dirt surfaces. The bubble laces in a wrap-around system also provide a secure fit, control, and comfort. In addition, the blown rubber molded outsole has secure hand grips and beautiful patterns which add to the level of traction that the shoes offer. Can you believe that these shoes weigh just 6.8 oz.? There’s nothing that can deter your movement to achieve those quick turns and flexible dance moves. You go, girl! The Women’s Ace is well-built for the money and pretty darn awesome. It’ll give you the energy to jump anywhere! I’d recommend this shoe if you want to have a good shoe for any competitive face-off and one that you can wear to practice. The Chassé Women’s Ace is a pretty awesome shoe. It comes with basic features to help you excel in your career by boosting your movement, comfort, and flexibility. The performance of a team has the potential to impact the outcome of any competitive faceoff – believe it or not. 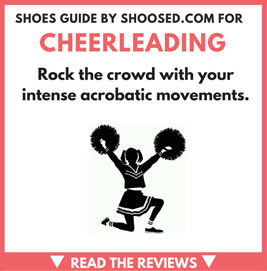 Cheerleading often demands intense physical movements to push the team to the limit, hence, requiring the most comfortable cheer shoes that are available for purchase. The best cheerleading shoes usually enable a cheerleader to move with more flexibility and agility and with greater comfort. There are a wide array of shoes on the market, but which one is the best one of you? Food for thought! From the reviewed pairs above, I’d recommend the Nfinity Vengeance. For one, Nfinity is well known for producing some of the best sports footwear. Secondly, the it delivers extreme performance on any surface and has more feature to keep you comfortable, stable, and flexible. 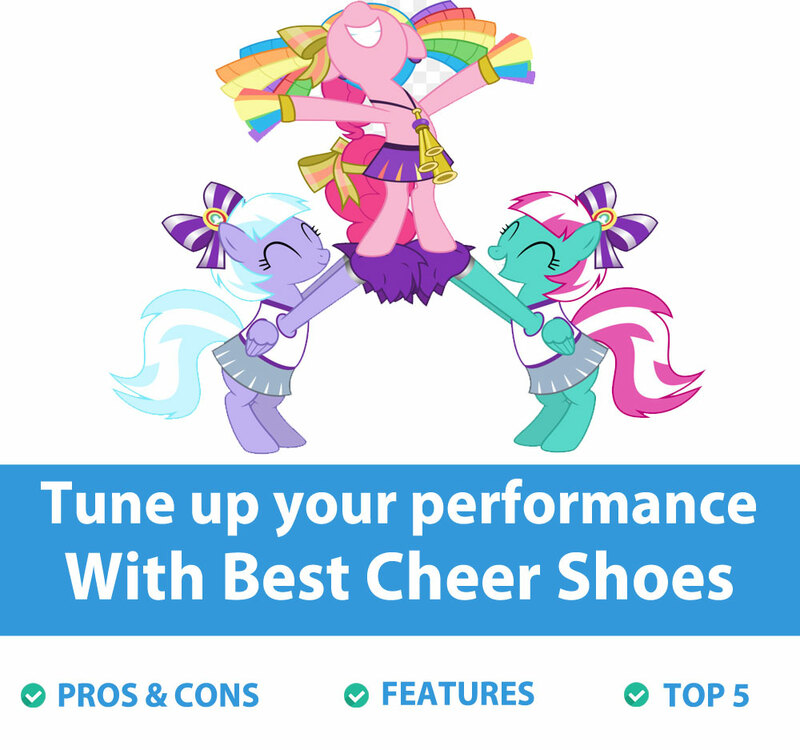 Tune up your performance by purchasing the best shoes for cheerleader on the market.